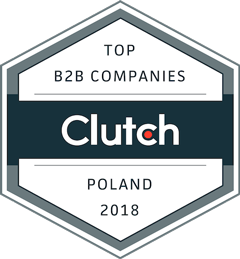 Located in the very heart of Washington, USA, a well-known research and review company Clutch has included us in its report as one of the best B2B companies in Poland. What is more, in Europe we were appreciated in the Europe Business Awards 2018 contest and won the title Best Web Design Agency 2018. Obtaining this title is not easy - this means that we are an experienced (our company is over 12 years old!) interactive agency, respected by the competitors and appreciated by our clients, offering comprehensive solutions for your company! What is more, we are constantly expanding our knowledge and skills, thanks to which our services achieve higher and higher standards. And perhaps the most important - our work is our passion, we just love it! In addition to our company being awarded as a whole, we have also received several awards for specific projects. We have been awarded e.g. by Awwwards, CSS Light, CSS Fox, Design Nominees and CSS Winner. We are also constantly taking on new challenges and we believe that there are still many awards ahead of us! If you want to join the ranks of our satisfied customers - it’s easy as can be! Use the free pricing option and pre-describe your project to us. We'll get back to you very soon! We can state with 100% confidence that their web portals and logos will be our hallmark for years to come. Our cooperation with Iguana Studio resulted in the creation of a modern, functional and elegant site. A great sense of aesthetics allowed us to refine the project in the smallest details. The final product turned out to be an accurate reflection of our expectations. Łukasz Grzankowski, Marketing Manager, STIGA Sp. z o.o. Cooperation with Iguana Studio means great contact and proper understanding of clients' expectations. Magdalena Lisiecka, Salko Sp. J.
Interactive Agency Iguana Studio is a trustworthy, reliable partner. Cooperation with their team is smooth and flawless. The administrator of your personal data that are collected during the correspondence using the contact form is Iguana Sp. z o.o. with its registered office in Poznań, ul. Głogowskiej 261, 60-104, entered in the register of entrepreneurs of the National Court Register under number 0000642441, e-mail: natalia@iguanastudio.pl, tel. +48 507 160 901. Personal data can be processed for the purposes of: performing activities before the conclusion of a contract or contract performance, presentation of a commercial offer, answering your questions – depending on the content of your message. The basis for the processing of personal data is Article 6 para. 1 letter b of the Regulation of the European Parliament and the Council (EU) 2016/679 of 27 April 2016 on the protection of natural persons with regard to the processing of personal data and on the free flow of such data (GDPR), i.e. the performance of a contract or taking action before the conclusion of a contract, Article 6, para. 1 letter a RODO, i.e. your consent, article 6 para. 1 letter f, i.e. the legitimate interest of the administrator - willingness to answer your questions and doubts. Personal data will be processed for the period that is necessary to achieve the purpose of processing, i.e. to conclude a contract, present a commercial offer, answer your questions or concerns, and may be stored until the end of the contract period and the limitation of claims under the contract. The person whose personal data are processed has the right to access, rectify, delete, limit processing, object to the processing and the right to transfer personal data, provided that the right to transfer personal data only applies to data processed in an automated manner. A person whose personal data are processed on the basis of consent has the right to revoke it at any time, without prejudice to the processing of personal data prior to the withdrawal of consent. The person whose personal data are processed has the right to file a complaint to the competent supervisory authority. Providing personal data is voluntary, but failure to provide them will result in the inability to perform a contract, take action before entering into a contract, present a commercial offer, answer questions or concerns.